Sate Lilit Bali (Minced Meat Satay)-Ground meat is wrapped around lemongrass skewers, grilled to perfection and served with spicy kecap chili sauce. 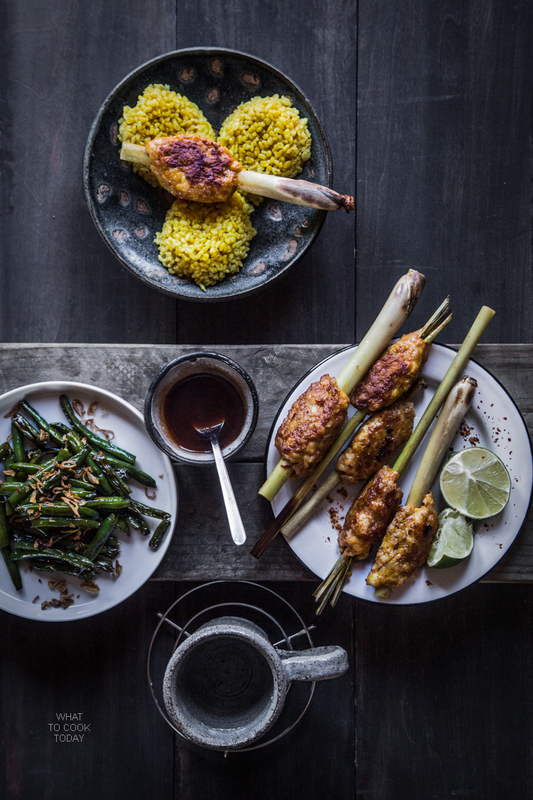 Sate lilit is a popular dish from the Island of Bali. The word “lilit” roughly means “wrap around”. The meat is usually wrapped around the skewers. 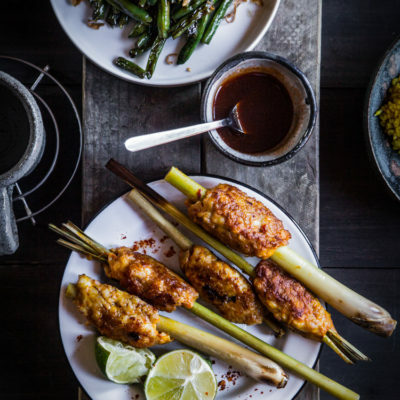 Traditionally, lemongrass stalks are used as skewers instead of bamboo skewers. 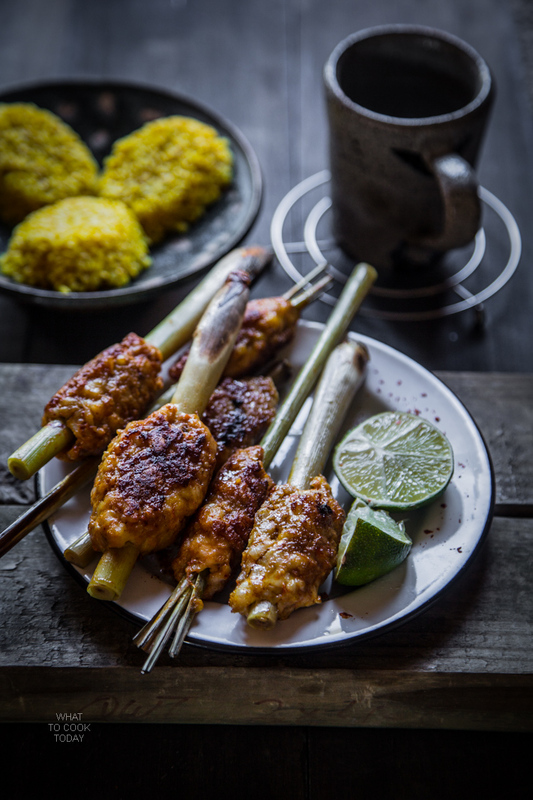 I really think using lemongrass stalk as skewers makes sate lilit taste even better 🙂 I love the aromatic lemongrass and when you grill it, it imparts that great aroma to the meat. Love it! The choice of meat is also really flexible. People use minced chicken, fish, pork, beef, duck, etc to make sate lilit. If you look at the list of the ground spices ingredients, chances are you probably not going to give this sate lilit a try. Indonesian cooking does use lots of fresh spices and yes, some of the spices can be difficult to find, for example kencur/Kaempferia galanga. Not every Asian store will carry this spices. It is not very commonly used in other Southeast Asian countries too besides Indonesia. It can be substituted with half galangal (which can be easily found in Asian store) and half ginger. It’s not perfect, but it’s the closest you can get. The main bulk of the work is probably finding spices. Once you have everything, the food processor will do the work for you 🙂 Give these a try and you might find yourself enjoying them 😉 We did ! My daughter loved them ! 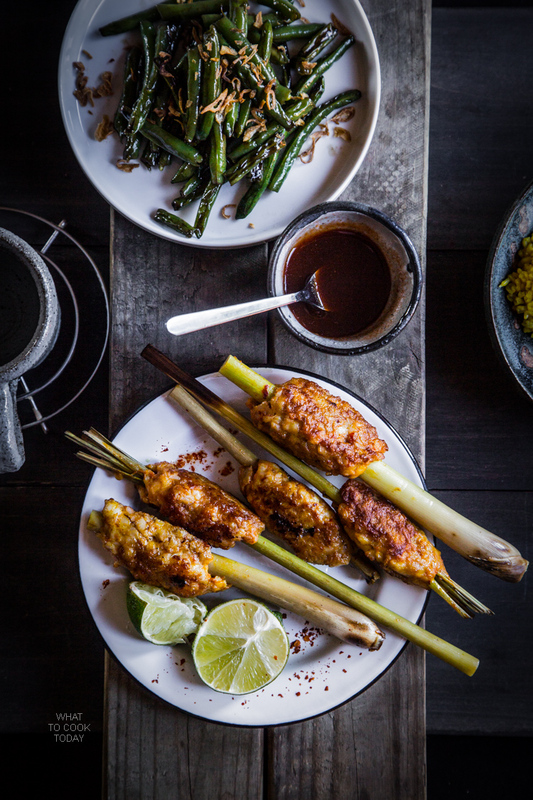 Ah, lemongrass sate skewers are one of my favourite things ever! And that list of ingredients is getting me really excited! I have – or have access to – everything except for the kencur so I will probably me making this real soon. Beautiful photos as always Marvellina. Hi, I am really happy with my first SATE LILI BALI! I am not sure what do you eat it with. What is thie name of that yellow rice in your photo? May I haVe that recipe too, please? By The way what do I do with The sauce? Do you use it after The SATÉ are ready? Or do you use it while grilling the meat? Please forgive me but I am really a first time at eating and cooking this. I am already proud of me to have found ALL ingredients. 😉💃🏿 Looking forward to your reply. Thank Y😋U! I’m so happy you like the sate lilit. You can eat it with regular white rice, the yellow rice (nasi kuning) in the photo is pretty tasty too. You can find the recipe here: https://whattocooktoday.com/nasi-kuning.html The sauce is to be served with the sate lilit once you are ready to eat them. Don’t use them to grill the meat. I hope I answered your questions and you should be very proud of yourself indeed 🙂 Thank you so much for letting me know too 🙂 Cheers. This looks awesome! I am going to make a test run this Thursday and I only have one question: when you say, “red chilis”, would I be correct to assume you mean thai/bird’s chilis? Yes, it’s thai chilis 🙂 You can tone down on the amount if you want too.